There is nothing like a great heated discussion about Fidel Castro and a puff on some great contraband. That may not be true. If you get into a discussion about Fidel Castro, you had better pray there are no CIA operatives in earshot. And I hate the taste of smoke in my mouth, including the lingering yuck of it from Benson-Hedges-loving women who want to kiss me, so cigars are absolutely out. Eeewwww! Belch! Spit. Spit. However, I do prefer good company and good food, and for this restaurant outing we partook of some great Cuban food. 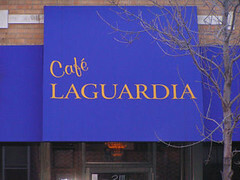 We dined at Café LaGuardia, located at 2111 West Armitage Avenue in Chicago. The restaurant has the ambience of a quaint Cuban eatery, minus the stereotypical gangster in his open collar shirt and henchmen standing around for garnish. The setting is dark from the mood lights, so this may be ideal for trysts. The waiting area has couches. Yes, you get to relax and have a drink while you wait for your seat, provided you get to the restaurant before the crowd pours in and the availability of couch space goes away. There is even a statue of a giraffe in the place — I know there are no giraffes in Cuba — and at the risk of over-generalizing, I do believe there were authentic Cubans in the kitchen rather than Mexicans. 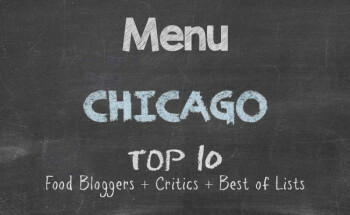 Chicago is famous for Mexican chefs in some ethnic kitchens. Well, now let us get to the good stuff. Because I got to the restaurant a little later than my friends, but earlier than we scheduled for our meeting, I had my before-dinner drink after they had finished theirs. The bartender deserved a round of applause because he or she fixed me an amaretto sour that made me want to dance. When my friends and I got to our seats, our pretty-pretty server came to take our orders. While she took our orders, a little bit of Spanish slipped out — that would be from me. She was very accommodating in explaining what was on the menu unlike some servers, which also makes the experience much more delicious for some reason. For an appetizer, we had Cuban nachos. Whenever most people think of nachos, they automatically think of hard corn tortillas covered in fresh tomatoes, beans, sour cream, cheese, and ground beef. Cuban nachos are fried green plantains covered with melted cheese, avocado, tomatoes, onion, sour cream and cilantro. You can also get your choice of chicken, ground beef, or steak with the nachos. I had a hankering for some more, but I had to deal with that hunger because my eating habits are making it hard for me to get my six-pack abs back. One friend ordered a Cuban gumbo that had my mouth watering, although I had a colossal plate of almond crusted red snapper fish with rice and black beans. My other friend had a stuffed halibut that had a creamy crab stuffing in it, while a guest he brought hovered over a pulled pork dinner until it ultimately defeated her. Her eyelids were getting very heavy. [I could go all night about what was on the menu, but I would have had to be a ladroneo and steal one to get into detail about all the goodies this restaurant prepares for the palate. Hey, it is not as though I have not lifted one or two menus in my day.] There was the usual silence that comes with enjoying the food we eat, followed by gradual conversation, ended by the clinking of forks against china because there is no more food on our plates, just a crumb here and there and smeared gravy. Do not ask me how we devoured all the food we had and did not go get some waiting customers up from those couches so that we could lie down and take naps. Because the portions were so huge, I do not know where we found any room for dessert. However, we attempted something sweet for the palate. In the spirit of eating a Latin after-dinner sweet, we ordered coffee — they do not sell decaffeinated coffee — and a flan — a cholesterol clog for the arteries, a certainty of me running my morning five miles. Why is the last bite the hardest to finish? Although there were four of us sharing the flan, which wasn’t a conservative serving, there was one piece that lingered until our fourth party member decided to gobble it up with a dollop of whipped cream. I hope she did not get a heart attack from the high cholesterol or a craving for Ritalin from all the sugar. If you want to take your husband, wife, boyfriend, girlfriend, mistress, or blow-up doll out for a good dinner, I recommend Café LaGuardia. The weekend crowd can be overwhelming if you hold out on eating for the entire day and then try to go late. The smells and sights of platters are so inviting that you may be inclined to either fight someone for their plate or resort to cannibalism. Hmm. The latter is extreme. The food is good and I would be the last person to argue about the price. Tick. Tock. Tick. Tock. Buzz. Oh, wait, that would be the timer on my oven telling me that my almond scented white cake is ready. Smile. As you can tell, I keep food on my mind and crumbs on my chin. I highly enjoyed reading your blogpost, keep up making such interesting articles!